A college campus is a destination for all kinds of interesting people, representing all kinds of research specialties and fields of expertise. 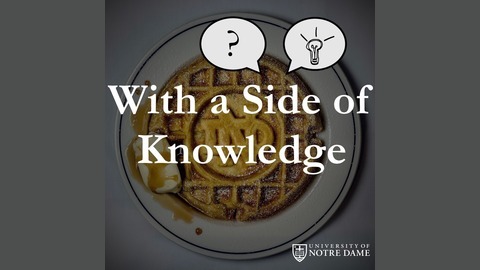 With a Side of Knowledge, which is produced at the University of Notre Dame, invites some of these folks out to brunch—yes, we said brunch—for an informal, 30-minute conversation about their work. 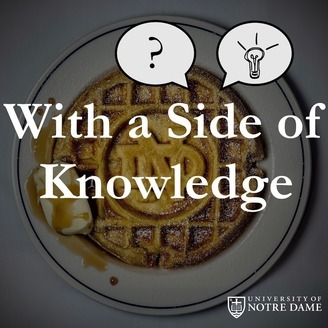 Some guests are members of the Notre Dame faculty, but many are visitors from elsewhere who have come to our campus to do anything from give a lecture or performance to participate in a fellowship program. The idea behind this show is pretty simple: A university campus is a destination for all kinds of interesting people, so why not invite some of these folks out to brunch, where we’ll have an informal conversation about their work, and then we’ll turn those brunches into a podcast? A contributing editor at Vanity Fair, Bethany McLean was previously a reporter at Fortune, where, in 2000, she received a tip suggesting she look into energy-trading giant Enron. Her subsequent investigative work would lead to a coauthored bestseller that became the definitive account of one of the largest business scandals of our time. She has also coauthored a bestselling book about the financial crisis and written two mini-books published by Columbia Global Reports. Bethany and host Ted Fox started their conversation with her experience covering the Enron story and other instances of, in her words, “business gone wrong” before moving onto the new podcast she’s developing, our disrupted media environment and the appeal of audio content within it, and that time she wrote a celebrity profile for the cover of Vanity Fair.